УРАЛЕЦBusiness with the “Urals” in the mountain will go! Stand of OOO “Tractor” at the exhibition “AGRO-2017”. In the photo (from left to right) Vladimir Andryushchenko, Governor Boris Dubrovsky, head of the Emanzhelinsky district Yevgeny Svetlov. At the traditional, already 24th regional agro-industrial agro-industrial exhibition “AGRO-2017”, the handsome “Uralets” became the center of universal attraction! A tractor-driver near the Chelyabinsk hockey arena “Tractor” with the same name! Pleasant, and the main actual analogue, given that it is here that our agricultural producers have gathered in recent years. Throughout the entire forum, the Uralets were surrounded by fans, figuratively speaking, of agrarian talent. Both kids and adults! The children did not want to leave at all. Mamas and dads had to tear their children off the wheel with tears. Still would! A real tractor, only smaller! And this is not a toy for you. Not rare, for example, “T-34”, and the working unit. Though now on the fields and in the gardens leave. On haymaking, plowing, cultivating arable land, harvesting potatoes or other vegetable crops. If you want, – fasten the blade and clean the territory. Yes, at least the excavator will be a plow, a drill or a baler, a ripper or loader, a cultivator or mower! Only one of the hitch and hinged devices in the company developed more than fifty! The most curious look at the technical specifications. The diesel engine, the tank holds 35 liters of “solar oil”, and this volume is enough for a whole daylight hours! For example, MTZ spends the same amount per hour. The operating weight is 980 kg. The overall dimensions are 2530/1200/1750 mm. High lift, excellent resistance to the effects of temperature changes (even at a temperature of -30 degrees), an acceptable cost. 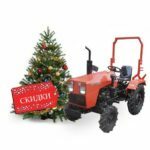 Due to small dimensions, the mini-tractor is very manoeuvrable, which is why it is actively used for small areas. It can be, for example, greenhouses, gardens and small hangars. The tractor is very easy to store – our “Uralets” fit even in relatively small garage boxes. At the AGRO-2017 in Chelyabinsk, Governor of the region Boris Dubrovsky noted that in recent years, agriculture has reached a high level and significantly increased its contribution to the economy of the region. 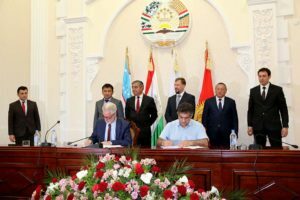 “The development of the agro-industrial complex has become one of the key priorities of the regional government, and this approach gives a significant return,” said Boris Dubrovsky. The head of the region also noted that the regional agro-industry actively joined the import substitution programs. In the region, enterprises of the most modern level are being created. “It is technical re-equipment that can change agriculture,” the governor emphasized. – Since last year regional subsidies for the purchase of equipment have been restored. Every year the state support of agricultural production and social programs increases. At the stand of OOO “Tractor” Boris Dubrovsky inquired about the development of production of our “Urals”. The head of the region, himself a leader of an industrial enterprise, who was familiar with production, was able to see a modernized model of the Urals-220 with increased engine power, a more powerful generator, a larger capacity of the fuel tank, an increased luminous flux, with hydrostatic steering, which simplifies construction and operation, increases maneuverability, and also increases the comfort of management. By the way, what is important, the changes have touched and the design of “Urals”. Our mini-tractor changed the radiator grille, navigation lights and hood, got an integrated gas tank. This rebranding has turned out to be very attractive, and, for sure, will be one more plus for the promotion of this already famous brand – both in Russia and in the countries of near and far abroad. According to the head of LLC “Tractor” today the work of the governor’s team, with the active participation of the Ministry of Agriculture of the region, gives good results. So, for example, with the support of the Ministry of Agriculture, the plant was returned a recycling charge, as a manufacturer of domestic special machinery. 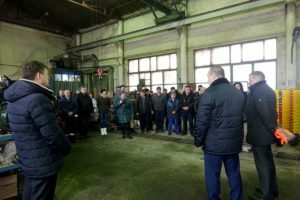 – This approach of the regional authorities, the government, concerning the support of local producers of agricultural machinery, can not but rejoice, – says Vladimir Andryushchenko. – And it aims precisely at the future, for the future development. By the way, Uralets-220 of the modernized model will go to the All-Russian agro-industrial exhibition Golden Autumn in Moscow in early October. 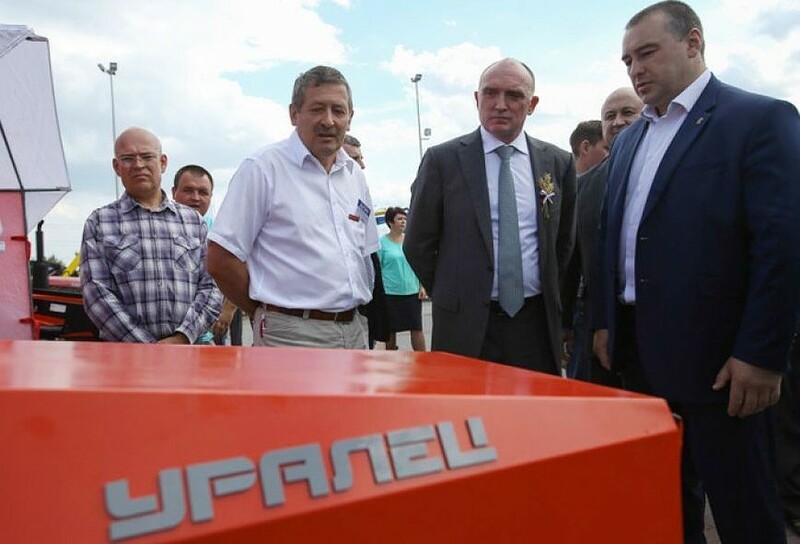 This productive, reliable and economical production technique of OOO “Tractor” will represent the Chelyabinsk region, among other known South Ural manufacturers. “Over more than 17 years of work, thousands of mini tractors of various modifications have come out of our workshops,” Vladimir Andryushchenko said. – The geography of supplies has significantly expanded today. Dozens of regions of Russia, Kazakhstan, Kyrgyzstan, Armenia, Belarus, some EU countries. Our customers and customers have appreciated the advantages of the Uralets brand – inexpensive but quite productive and unpretentious and economical equipment, without unnecessary electronics and functionality (by the way, no more than 1% of failures were recorded during the Uralets guarantee period). Ideal equipment for small farms, private farmsteads, municipal services of municipal farms. With payback – a maximum of two seasons. Thanks to the whole team, the initiative, creative approach of the staff, the work of our dealer centers throughout the country, the support of local authorities, the enterprise, created in fact, from scratch, today successfully competes in the market with imported equipment. We create new jobs, index wages each year, work with local manufacturers of spare parts and components, parallel developing and supporting related industry. In Russia there are about 18 such partner enterprises, eight of them – in the Chelyabinsk region. Our main task is to expand the sales market. The Council of the labor collective has been working at the enterprise for a long time under the chairmanship of Fail Giniyatullin. He has been working at the enterprise for a long time. An experienced, knowledgeable specialist, Fail Rakhimulovich organizes the team to solve his pressing problems. The Council is a kind of trade union committee, which directs the directorate to work purposefully, to solve various social issues. – Taking this opportunity, I sincerely congratulate all our team, partners of the enterprise, customers, subcontractors, veterans of the industry on the Day of Machine Builder! New innovative solutions, new approaches in business organization, new creative, technical findings, embodiment of ideas and ideas! Personal and family happiness, health and well-being! Chairman of the Council of the labor collective F. Giniyatullin. The new model Uralets-220 became one of the main attractions of the agrarian exhibition! Mini-tractor “Uralets” is intended for public works, farming, personal part-time farming. It is produced in various trim levels – from 18 to 22 liters. from. Over the years, the company has produced more than 21,000 mini tractors. The enterprise is a winner, prize-winner and laureate of dozens of all-Russian and international industry exhibitions.